Earn Gratitude Dollars by Referring Friends & Neighbors! Your attic does more for your home than simply serving as a storage area for all your unused belongings. It also offers defense against sudden temperature changes. Still, for your attic to do what is expected of it, you need to insulate it the right way. In this post, DryTech Roofing discusses how sufficient attic ventilation lowers energy bills, extends roofing shingle life and stops roof rot and ice dams during winter. Areas such as attics, garages and basements are where sudden air change happens normally. Insulation works by trapping air within small pockets to resist transmission of heat, so it does not move into or out of your home through your windows, doors, or roofing system. Without proper insulation in place, temperature from the areas stated above will transfer right through property’s components such as the wood framing and the drywall. What’s the Result of a Poorly Insulated Attic? Aside from the heat that moves by transmission, you can also lose heat in your home’s attic through any cracks and gaps, because warm air naturally rises. All of the heat winds up at the highest point of your attic – the peak of your roofing system – and then moves out through your roof shingles. Per the Department of Energy, homes in Maryland should aim for higher R-values when it comes to attic insulation. This is because higher R-values improve the performance of the insulation. As a trusted roofing company, DryTech Roofing only installs the most effective type of insulation – the fiberglass insulation. 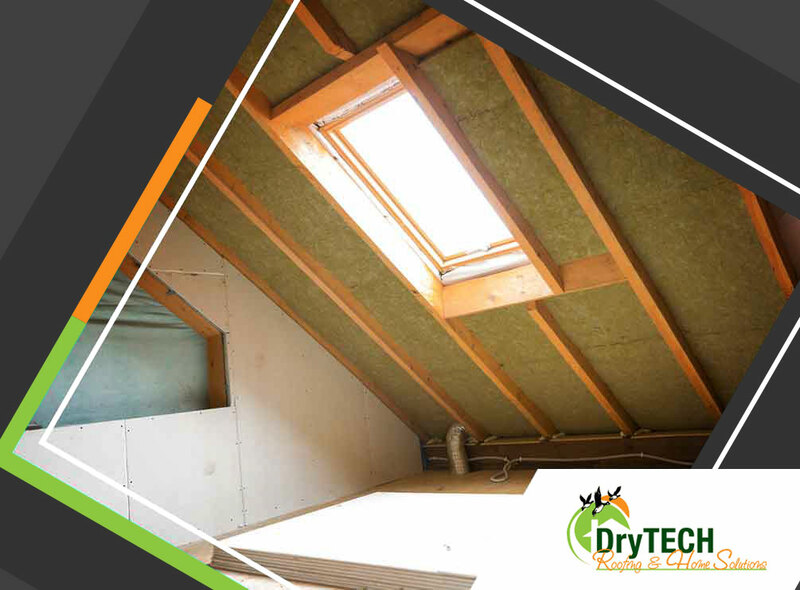 Regardless if you have an aged or a brand new house, DryTech Roofing is one of the trusted roofing companies that can easily install attic insulation to protect your roofing and lower your energy costs. Our team of highly knowledgeable experts can make a comprehensive energy analysis to guarantee you a quality service recommendation. Trust DryTech Roofing, one of the area’s highest rated roofing companies, for all your roofing needs. Contact us at (240) 491 5600 to learn more about our insulation service. You can also fill out our contact form for a free estimate. We proudly serve communities in Maryland.